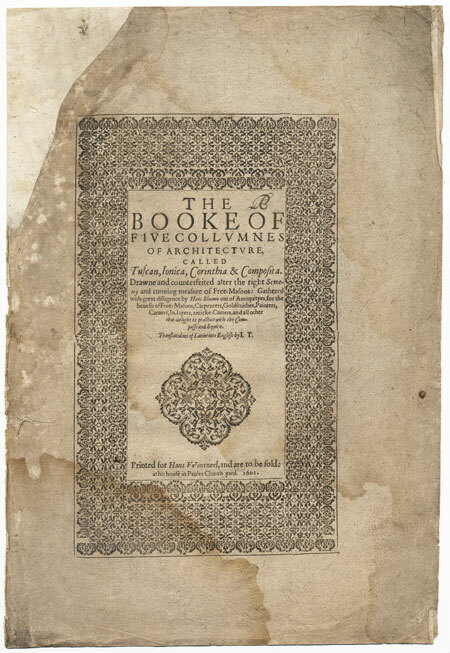 Inigo Jones’s total immersion in Italian erudite and artistic culture was unique in early 17th-century England, but other architects also aspired to the literary and humanistic ideals of the time. John Thorpe (1564/5–1655) was a surveyor and architect who came from a long line of Northamptonshire masons. In 1583, he became a clerk of the Queen’s Works, where he was employed as an accounts-keeper and draughtsman, carrying out various small-scale improvements at the royal palaces. In 1601, he left the Crown’s service and established what would become a successful and long-lasting private practice as a surveyor of both estates and buildings. Despite his practical background, Thorpe was not unlettered. He translated from both Latin and French and pursued an interest in continental architecture that went well beyond that of most craftsmen of the time. In many ways, Thorpe represents the impact of the Italian Renaissance not in the rarefied environment of the court but in the everyday world of the craft practitioner.